BBC Discusses Computers In Cars, Says People Don't Want "Soulless Automation"
Top Gear columnist Paul Horrell, writing for the BBC's news magazine, has penned a piece discussing the proliferation of technology in the modern automobile. He notes that computers are "changing our relationship with the open road." Hmm. Sounds familiar. Echoing the wild-eyed ramblings of a mad New Yorker call to arms of the gentle, fun-loving soul who hired me, Horrell goes on to say that people want an individual relationship with their cars. 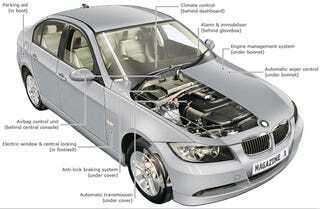 Electronics, he notes, can help, and should not hinder, the thrill of driving. We can't help feeling like we've heard this sort of thing before. We aren't usually the toot-our-own-horn type, but in a case like this, it's nice to know that you're not yelling into a hurricane. To review: Technology not bad; technology good. Computers good. Jalopnik good. Uninvolving, distant cars bad. That is all.